The strainer works awesome even for the real tiny dried tea leaves. It was a Christmas present for her. I bought 2 extra cups because we have to small children. guess what the kids can't brake them. Sometimes the kids couldn't pick their cup up but they just used a spoon. 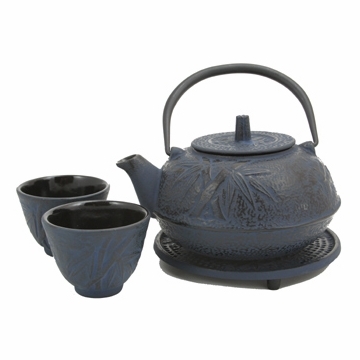 also the blue paint or dye does not come off the tea set. I saw that with other cast iron tea sets. This tea pot is wonderful! My only complaint is that even though it is very cute and small, it is very bad for kids because the cups heat up very fast when you put tea in them and they would burn themselves trying to hold the cups. I bought this for a friend as a gift. I am very pleased with the tea set, it's high quality, looks great and my friend loves it. I looked in stores and on the Internet and will be making more purchases at enjoyingtea.com. The order process, customer service and free tea sample were all great. Beautiful tea set. The color is very pretty and the pot is sturdy. I got it for a Christmas gift for my husband because I accidentally broke his ceramic one. I couldn't break this one if I tried! He absolutely loves it!